In 1534, Henry wanted to divorce his first wife Catherine of Aragon so that he could marry his new love, Anne Boleyn who he hoped would give him a son. At the time, England was a Catholic country and the head of the Church, the Pope, would not allow divorce as the Catholic faith believed in marriage for life. Henry VIII therefore set up the Church of England and made all Church officials swear that he was its leader so he could arrange his own divorce. This process was called the reformation and was confirmed by the Act of Supremacy (1534) which declared Henry to be the Supreme Head of the Church of England. He declared any monks who spoke against him to be traitors and had them executed. 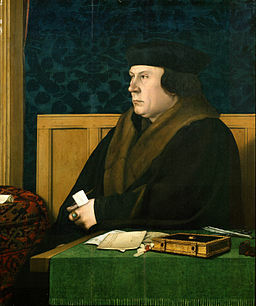 In 1535, he sent royal commissioners led by Thomas Cromwell to all the monasteries (where monks or nuns: lived, prayed, worked and studied) who reported that many were breaking the rules by using money earned from their rich farmlands to pay for luxury living standards. Between 1536 and 1540, Henry VIII then ordered the closing down of all: Roman Catholic abbeys, monasteries and convents across his kingdom. He: took ownership of all their possessions, had their buildings pulled down and sold off all their land. This act became known as the Dissolution of the Monasteries. It stopped monks and nuns from opposing him and it also meant that Henry could share the monasteries' wealth with his followers.